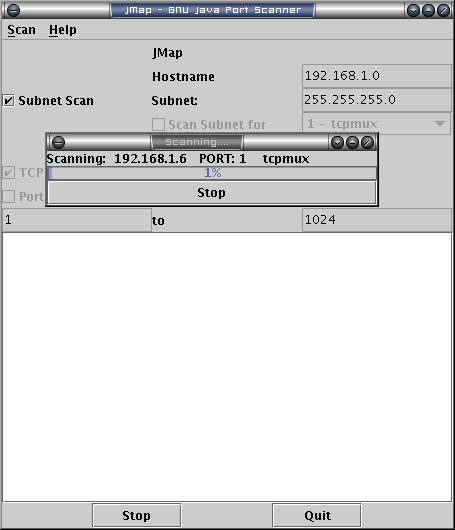 JMap is a Java network port scanner, a security tool to identify open ports on any host or network subnet. It features the ability to scan every host in a given network segment for a range of ports or a specific service. Both TCP and UDP are supported. This application is designed to be used as a security tool, so as to identify potential vulnerabilities on the systems that the user is responsible for. I take no responsibility for any improper use. Source code provided here is freely available under the terms of the GNU General Public License. how to start this one,how to break this into modules ??? (or double-click on the jmap.jar) You will need the Java Runtime Environment installed. It’s been a while since I did any work on the project. It was written for Java 1.3 when I was a student, hope it may still be useful and apologies if the code quality isn’t what it should be – it was just a quick project for fun. If I remember correctly, the GUI is contained within the JavaFE class. Scanning is multi-threaded, with many hosts and many ports being scanned simultaneously. The results of each individual scan is passed to the main thread using the Observable mechanism.